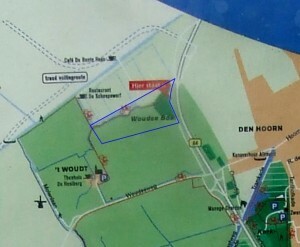 Navigation system address: crossing of Lotsweg and Veenackerweg, Den Hoorn. Park just before the Lotsweg road bend, on the grass/gravel embankment. Basically, the ‘parking lot’ is at the beginning of the cycle lane (to the right of it) that takes you to the recreation area. Just in front of an old cattle barrier sheltering hens and ducks. The domain is surrounded by a blue line on the map. No catering on this walk, but if you fancy a somewhat longer trek, there is always the Bonte Haas (cafe/restaurant), the Scheepswerf (upmarket restaurant) or the Hooiberg (country teahouse). The entire area is strictly on-leash, but I have never ever come across a gamekeeper there, nor have I heard of anyone who had. The landscape is a little flat, but it has the usual shallow brooks and still-water ponds, and quite a bit of marshland vegetation. It also has a few bundles of trees (calling it woods would be a bit much) which you might want to explore. It is lovely to stop for a summer picnic on an embankment there, if you manage to find a quiet spot next to the water. Depending on where you look, you can admire impressive stretches of green, with flat agricultural meadows as far as the eye can see. You often catch a glimpse of the spire of the church of ‘t Woudt in the distance: a tiny, pittoresque little village. Walking all the way to the village is well worth the detour if you have time on your hands. It does not get quainter than that. It’s a favorite teenage hang-out on warmer evenings, so your eye will often wander to a can of coke or a chocolate bar wrapping. I am afraid fishermen are no more respectful, with disused picnic chairs, floating plastic bags and empty beer cans scattered all over the pond. The garbage is concentrated in the woody bit, so you shall come across it mainly if you venture off the cycle path. I presume that is where teenagers like to get away from prying adults eyes to get on with whatever half-illegal activities teenagers get up to these days. Be careful when you let the dog out of the car, as you are very near a country road where cars often drive way above the speed limit, and there are hens and ducks where you park, so if you have a chasing dog, he could lunge out of your control and cause a traffic incident. You can’t really do a nice short round. You have to backtrack on yourselves and re-do the walk back to the car unless you have a few hours to do a huge circle. If your dog is a swimmer, I should discourage it, as the water utterly stinks there, and the dog will come out dark brown and smelly for days, even if you wash it. There is no dedicated path for pedestrians, just the one cycle path for all users to share. On a sunny day, you shall have to call your dog to you every split second so he does not get in the way of the bike traffic. Best to leave this walk for an overcast day in the middle of the week to avoid the crowds, I should say. The landscape is not that exclusively green and natural: depending on where you look, you shall get a view from the (Delft) city high-rises and lots of close-by greenhouses. So if you want views that make you ‘get away from it all’, this isn’t it.